Great Nerd Rap. These hilarious(if you’re a nerd) Plixer Cisco Rap videos are very clever and very well worded. The rap artist Mix Master Mitch appears as several characters in all 4 videos. They offer networking products such as Scrutinizer and Netflow working with Cisco hardware. I really like this one because I used to work in a call center and had to take calls from panicked admins with simple problems all of the time. You may want to skip ahead to 2:30 to bypass the extra long intro. In this video the new banker CEO meets the tech department and catches them by surprise over Cicso WebEx video conference. It’s pretty good, you just have to skip ahead. Too much fluff. 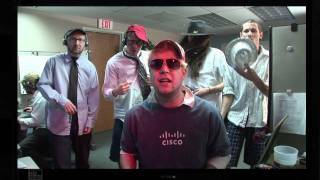 Scrutinizer Cisco Rap Video. This video is great! Packet Loss and Latency are found on the scene of the local network but claim they are not to blame. The CEO is put on trial by Detective Scrutinizer for mismanaging the IT Network infrastructure. This first video shows Mitch rising through the ranks of his IT Department from start to Network Admin to VP of Information Technology for his implementation of Plixer Scrutinizer on Cisco Switches with Netflow.